(CNN) -- Famous for honest self-portraits, Mexican artist Frida Kahlo said that she painted her reality and that her paintings carried a message of pain. Her life was full of it, both physical and emotional, and she used it to fuel her art. Frida Kahlo was born in this house and lived in it with her husband, Diego Rivera. Much can be learned about both her private and public life by visiting the home she shared, first with her parents and later with her painter husband, Diego Rivera. The bold blue house with red trim stands out in the quiet residential street of the Coyoacán section of Mexico City. It was painted that way because Kahlo and Rivera felt that the bright colors represented Mexican culture better than the original white paint. This home-turned-museum, known as La Casa Azul, is where Frida Kahlo was born, began to paint and died, making the house a witness to one of the most important artistic lives in Mexican history. The museum entrance leads to a large patio where pre-Columbian sculptures collected by Diego Rivera throughout his lifetime are scattered among the plants and fountains. The couple's love for traditional Mexican art can be seen throughout the house, from the large fireplace designed by Rivera that dominates the first room, resembling a step pyramid like the ones built by the Mayas and Aztecs, to Kahlo's paintings and the couple's collection of smaller sculptures. Some of Kahlo's most well-known works, such as "Viva la Vida," a still life of watermelons, are on display in the museum, but it is the personal objects that tell the most interesting stories. An entire room is dedicated to communist paraphernalia. Kahlo was very politically active and did not hide her political leanings. In fact, she and Rivera invited exiled Russian communist revolutionary Leon Trotsky and his wife to live with them in the late '30s. As visitors move through the museum, it is the remnants of Kahlo and Rivera's private life that begin to tell their story. Part of the collection is a bed with a mirror attached to it, used by Kahlo in order to create many of her celebrated self-portraits. At the age of 18, she was left bedridden for a few months when her spine was broken in a serious bus and trolley accident. It was during those months that Kahlo began to paint, to help pass the time and keep her spirits up. Also on view are several corsets that Kahlo had to wear during her lifetime because of lasting injuries from the accident, several surgeries and a childhood bout of polio. It was because she began painting that Kahlo met Diego Rivera, who was at the time a famous Mexican muralist. Kahlo wanted to know whether she had talent enough to make art a career, so she sought out Rivera to get his opinion. That was the start of their famously tempestuous relationship. They were married for the first time in 1929, but after infidelities on both sides (including an affair between Kahlo and Trotsky), they divorced in 1939. They were married again a year later. She once commented on their relationship, saying that there had been two great accidents in her life, the trolley and Diego; Diego, she claimed, had been the worst of the two. The house, which was witness to the birth of Kahlo on July 6, 1907, was also witness to her death July 13, 1954. Rivera put her ashes in a pre-Columbian urn, which remains in the house to this day. He donated the house in 1957, and it opened to the public as La Casa Azul, Museo Frida Kahlo in 1958. 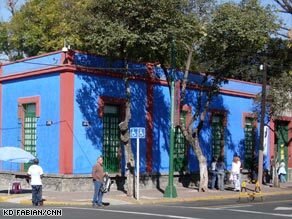 So the blue house, which has seen so much of the history of two of Mexico's most famous artists and was witness to so much of Kahlo's personal suffering, is open to the public, ready to tell their story to all who are willing to listen.